"Leonid Meteor shower occurs when earth passes through the debris the comet Tempel-Tuttle leaves on its orbit as it enters the inner solar system every 33 years. Leonid meteors will be of 1mm-1cm diameter and travel to the earth’s atmosphere at around 160,000 miles per hour. 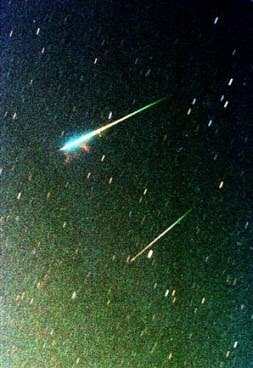 Leonid Meteor shower occurs every year around mid-November. The meteors appear to be originating from a single point in the sky albeit they are running parallel to one another."